Western PaddleSports has set new standards for safe and effective training for those entering adventure & multisport events. We not only train entrants wanting to tackle their first Descent, but can also provide training and entry certification for competitors wishing to enter overseas events such as the NZ Coast to Coast Race. We cannot guarantee you will succeed, but based on client feedback, every client who completed our recommended training course has managed to finish the event at their first attempt. We congratulate all of you who have succeeded in your efforts to finish this demanding event! Whether you plan to paddle a kayak or some type of ski or other sit on top craft, our program will assist you to be as well prepared as possible to tackle the event. We suggest you leave the decision as to what you may paddle until you have done our Initial Skills Course and have gained some elementary knowledge and paddling skills. We suggest you will then be in a position to make a better informed selection of what might suit you best. Our program consists of several modules. Some of these incur fees, particularly where courses are involved or qualified instructors and leaders are required to supervise you in training programs on white water. Other parts of our program are free of charge to our clients, and are provided as part of our contribution to supporting the event and in particular assisting you if you are a novice paddler to gain the knowledge necessary to enter and succeed in your attempt. full day for kayak skills or half day for ski paddlers. Novice paddlers should first of all book onto our Initial Skills Course. This can be done at any time. Courses are normally held on a number of occasions each month, particularly in the early part of the year. You do not need any equipment to get started. The earlier you start your initial training, the better you will be prepared to tackle the event. Armed with the knowledge and skills you will get on this course, you can begin accumulating the items you will need to start your own training program. Please see course number 2 in the flatwater section for details. It is assumed ski paddlers have already decided to paddle a ski and will have their own craft. 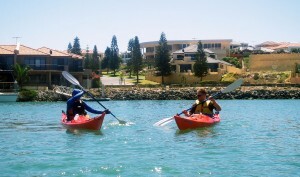 Kayaks are provided for those who do not yet have a suitable craft. Part of participating in the Descent is developing a regular and effective training routine. To assist our clients, we provide a regular Tuesday evening paddling opportunity. There you can meet other entrants, arrange to train with others who may be willing to follow a similar routine to yourself, undertake review of your skills as you practice, and develop other competencies outside of the initial course. Our Tuesday evening program is free of charge to all clients. There are no club hassles or fees, just a group that enjoys paddling and is happy to provide you with the encouragement and participation opportunity that will help your preparation. Once we get sufficient winter rain, typically in July, we can begin our white water training program. 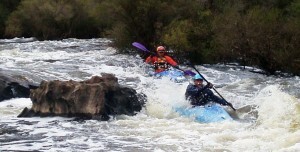 The first step is an introduction to whitewater event. This may be on either the Avon or Murray Rivers depending on where conditions are most suitable. Typically we get useful river flow on the Murray before the Avon starts to flow. This event is an essential step in converting the skills you have been building on flat water to effective use in moving and whitewater. Depending on your performance during introductory training, you may need additional training in order to meet adequate standards for event entry requirements. Each event has entry conditions that must be satisfied by first time entrants. While the skills and training required for events of this nature are similar, entry conditions vary. Western PaddleSports can train and assess you for the certification you require in order to participate as a first time entrant. Our brief whitewater season provides a very narrow window of opportunity to tackle the whitewater part of your training, so we recommend you tackle the preparatory work and skills courses well in advance of our winter rainfall season. Each event publishes the entry requirements on their website. We suggest you familiarise yourself with the requirements of any event you plan to enter. 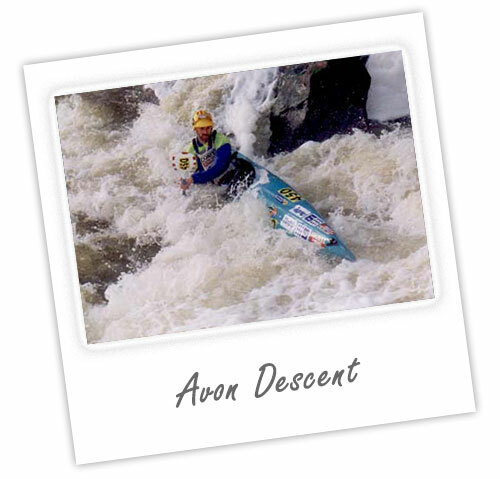 We are able to provide Avon Descent entry tests for those who may not have done other skills training with us. Please contact us if you require this assistance. Assessment fees vary with entry requirements.